Some time back, perhaps a year or two, Planters Gold Pyrat XO Reserve became Pyrat Rum XO Reserve. The name change was subtle, and the label changed slightly to match, although the familiar (and beloved) handblown glass bottle remained the same, as did the accompanying ribbons and Hoti medallion. As time passed, I received an occasional email from readers asking if I’d noticed a difference in the new rum vs. the old. Some of these readers had claimed to have contacted the distillery to inquire, and passed along that the distillery claimed no changes had been made to the rum itself. Nonetheless, many fans seemed to have noticed something different. In the glass, both rums are golden amber. The new XO is a bit brighter, while the old has a more subdued brown undertone – sort of like the difference between apple juice and cider, but not quite as extreme. To the nose new XO is light and sharp, with a cool, citrusy aroma. Old XO is warmer and muskier. It’s still citrusy, but also has a distinctive hint of rich caramel. Upon sipping, new XO is sharp and tingly across the tongue. The texture is buttery, and the flavor sugary and very akin to oranges. Old XO, in contrast, is much less tingly and somewhat more refined. As it warms across the tongue it thickens, and carries the flavors of toffee and butterscotch, again with a hint of orange. When compared side-by-side, there is a notable difference between the two, and I feel the old XO is clearly the superior product. Its musk and toffee effect make for a richer and more complex rum, while the new XO is light and shallow by comparison – almost candy-like. For some this sharp sweetness might be a plus, but I have to consider it a definite step down from what Planters Gold XO Reserve once offered. 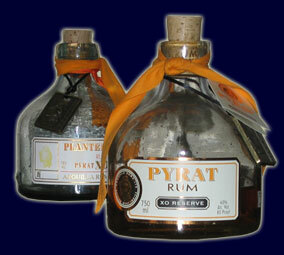 Note: Pyrat rum has two other (primary) rums in its family – Pyrat Pistol and Cask 23. Unfortunately I am unlikely to ever perform a similar test with these rums. My bottle of Cask 23 is long empty, and my single bottle of the old Pyrat Pistol remains (and WILL remain) unopened. However, I have heard mumblings and grumblings that both of these rums – like XO – aren’t what they used to be. Readers and drinkers will have to decide for themselves. This entry was posted in Commentary and tagged pyrat by Bilgemunky. Bookmark the permalink. I have a bottle of the Planters Gold Pyrat XO Reserve. From what I’ve read is the old XO its hand numbered 140681 I have not broke the seal was wondering if it might be worth anything as I have yhad it for a number of years. Feel free to e-mail me. I’m not sure what the street value would be of an old bottle of XO. I doubt it would put your kids through college, but it might be worth an extra few bucks compared to the shelf price. KK guess I will stick with the idea of possibly opening it for my 30th B-Day on the 15th.